I have spent the past 26 of my 35 years in school. People don’t get this. Of course, it was full time until I was 22. Then it was on and off. And I don’t want to jinx it, but it looks like I am going back part time again in August. If someone asked me the minute I finished my teaching job in Connecticut if I would consider a career in special ed, I would have laughed at them. My job was intense. Don’t get me wrong–that was the job that helped me realize that I was a teacher. But HELL no. Ten years later? HELL yes. See, what I learned working kids with emotional disturbances, dyslexia, Asperger’s, ADHD, and OCD gave me an advantage in a regular classroom–I spot these diferences a mile away, and if they are undiagnosed or the student isn’t well-understood, I swoop in, out of the goodness of my heart, and fight for their success. I’d rather help one kid who struggles than an entire classroom of kids bored and getting an A. Is that terrible? Well, it looks like that the change I have been looking for might come in the package of my own special education classroom. We’re talking learning differences, not severe disabilities. And I am psyched. I have a few weeks of keeping my fingers crossed, and praying that the rug isn’t pulled out from under me at the district level (these things happen), but I would be walking into my dream scenario. A chance like this one does not happen often, and although I have cashed in all my karma chips recently after losing my three favorite gold bracelets at the Oakland Airport (which were kindly returned by a saint TSA worker named Anita), I am hoping that my patience in the classroom, my diligence as a student, and my passion for teaching is enough to allow the karma gods to tip the scale in my favor. It’s not a pay raise–in fact, I will be paying to go back to school for a credential in special education. So that’s not cheap. But I’m not content in my job right now. Do I want a complete career change and suddenly work for a media or software company? Absolutely not. But I think this switch is due–7 years in the same exact spot. Seven year itch. It’s true. So change is in the air for me. Plus, I’m full-throttle on my health kick. I have 15 more pounds to go, and I am heading to Ireland on March 30th. I’d like to hit that goal by then. And even more so, THIS is the summer where I will wear whatever I want on the beach. I could never say that even as a child. But. Mark. My. Words. My street smells like orange blossoms, Union Street is filled with freezing girls drinking too many mimosas outside in their strapless dresses, and everyone’s in shorts running on the Marina Green. February for me is the beginning of bright colors and flowers and French white wines, strolls to the farmer’s market, and light scarves instead of coats. 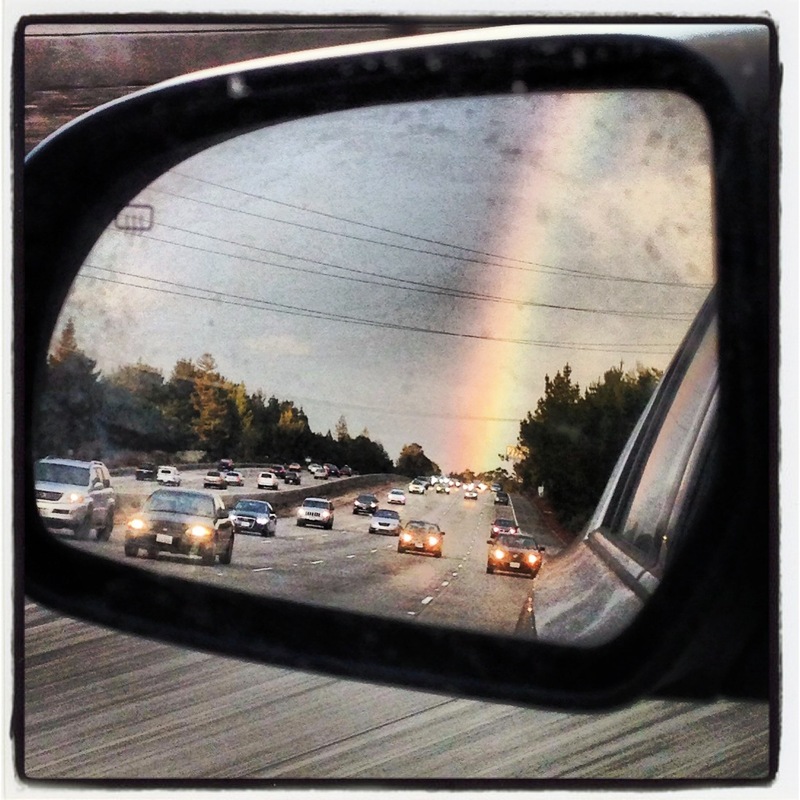 Looks like driving through a rainbow is pretty magical.